World No. 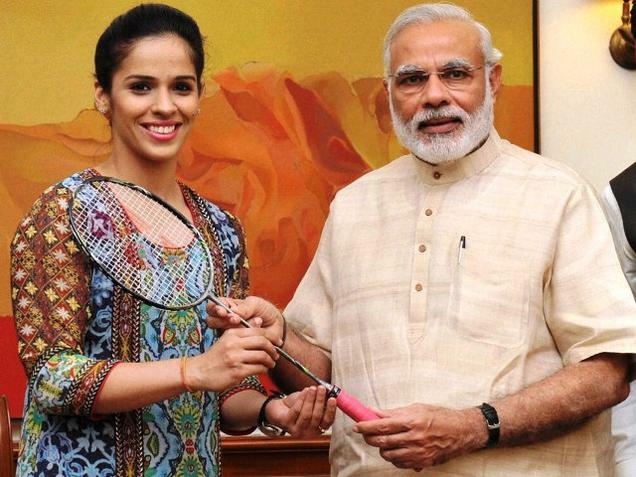 1 shutller Saina Nehwal gifted her racquet to PM Modi as an advance birthday present. World No. 1 shutller Saina Nehwal on Wednesday presented her racquet, with which she played to become the first Indian to win silver at the Badminton World Championships, to Indian Prime Minister Narendra Modi. She presented it as an advanced birthday present as Indian PM Modi will turn 65 on Thursday. The super girl of Indian badminton, Saina has been an achiever of numerous firsts in her magnificent badminton career. Though She had lost to Spain’s Carolina Marin in the title conflict of World Championships in Jakarta a month ago yet at the same time turned into the first Indian to win a silver award in the prestigious competition. PM Narendra Modi also thanked world no. 1 Saina on twitter. Some days ago a coworker of my parent informed me about the site. I did not have energy to have a look at it and right now I’m furious that I haven’t understand it day by day – I have so a lot to compensate.